It’s spring time, which translates to more outdoor fun as we gear up for summer. The retro feel of tiki decor is always in style and its complimentary theme let’s us escape our backyard into a bamboo enchanted island setting. 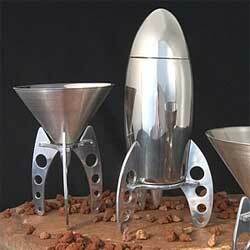 So get your tiki bars out and check out our tiki decor page for more ideas. 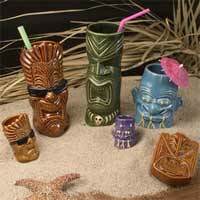 What tiki bar is complete without tiki themed mugs, tumblers, shot glasses, and for the nomadic drinker, a flask? These are all available from our friends over at After5. Made of ceramic and with some clear detail these mugs are ready to impress and intoxicate your guests with some tiki flair. Buy these dishwasher safe mugs, tumblers, and shot glasses in a set or individually to customize your very own tiki decor. Call them drink markers, drink hangers, or just plain fun, Mable’s has always been a fan of cocktail glass decorations. Due to the success of the cocktail monkeys, mermaids, and elephants the powers-that-be have created some new friends to hang from our cocktail glasses. Now you can adorn your beverage of choice with a black cat cocktail buddy (for that retro look) or a red demon, complete with pitch fork (for that little devil in all of us). 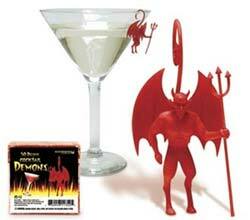 Each box comes with about 50 little drink hangers to help your party goers remember which glass is theirs. Whether you’re throwing a small lounge party or a big open bar type party these cocktail hangers always get rave reviews. I suggest handing out one for each drink refill so by the end of the night, or early morning, everyone can review how many drinks much fun they had. Come Monday morning your party goers can hang these from their cubicle, office desk, office lamp, etc. and they will forever remember the great time they had at your party. You can also use these as secret invitations; just hand out one to each coworker you’d like to have attend your get together and they’ll know whose house to be at this weekend. Got any other ideas or past experiences with these little drink markers? Leave a comment and share it with everyone.